Dr. David Albin has performed 12,000 hernia surgeries and has over 25 years of experience. What is an Abdominal / Ventral Hernia? An ventral hernia and an epigastric hernia are also known an abdominal hernia, both occur in the front of the abdominal wall. An epigastric hernia occurs in the upper midline below the breastbone or sternum. A ventral hernia usually appears in the midline. These hernias typically result from a tear or division in the muscles or fascia. An epigastric hernia is a subtype of the ventral hernia. A hernia on the abdominal wall is classified as an abdominal hernia. An abdominal / ventral hernia is usually composed of fat and rarely contains abdominal organs. An abdominal / ventral hernia can develop as a result of an increase in intra-abdominal pressure from lifting or straining. An abdominal / ventral hernia can be asymptomatic (meaning there are no obvious symptoms). However, it is also known to cause pain with straining. If an abdominal / ventral hernia is not treated, it may increase in size and may become strangulated or incarcerated. An abdominal / ventral hernia can be diagnosed by a physician during physical examination. The hallmark is the presence of a bulge on the abdominal wall that may or may not be reducible. An X-ray is not always necessary to diagnose an abdominal / ventral hernia. If the diagnosis is uncertain then a CT scan or MRI should be preformed. If you have been diagnosed with an abdominal / ventral hernia you should consult a hernia specialist. At the Hernia Center of Southern California, we repair abdominal / ventral hernia using the “tension-free” mesh technique. Abdominal / ventral hernia repair can be performed as a same day, outpatient procedure under a local anesthesia with sedation. We also perform abdominal / ventral hernia repairs using laparoscopy which requires a general anesthetic. 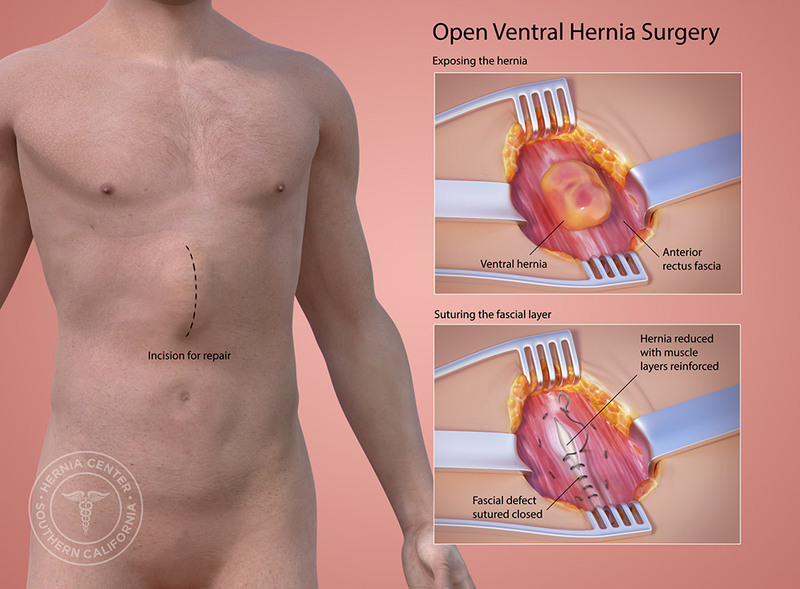 During abdominal / ventral hernia repair, the mesh is placed behind the weakness or hole in the abdominal wall. The mesh is tailored to extend past the edges of the hernia. This ensures the mesh will act as a sturdy platform for all new tissue growth and supports the existing abdominal wall muscle. Muscles are never cut and nothing is sutured together to cause tension. The polypropylene mesh is thin and incredibly flexible throughout the healing process to incorporate safely into the muscle wall. Dr. Albin is a well recognized expert in abdominal / ventral hernia repair. The Hernia Center of Southern California specializes in all types of advanced open and laparoscopic hernia surgery. Dr. Albin has performed over 12,000 hernia surgeries in 25 years. His surgical practice is limited to the diagnosis and treatment of hernias. He is truly the hernia specialist. Patients see Dr. Albin from Los Angeles, Orange County, Riverside, San Bernardino and San Diego Counties as well as throughout the United States. The Albin Tension Free Mesh Technique is recognized worldwide.